A stunning detached farmhouse, finished to exacting standards, with four en-suite double bedrooms and superb equestrian facilities including stable blocks, turnout area and outdoor arena. All situated within just over 12 acres of grazing land, with beautiful panoramic views across open countryside, Pendle Hill and the Three Peaks. White Stones Farm has been upgraded and finished to exacting standards with a bespoke handmade kitchen, oak fitted study, stone flagged floors, under floor heating, exposed beams and original fireplaces. The property has a good mix of old and new. Externally, are well presented gardens, patios and a double garage offering further accommodation or ideal as office space to the first floor. The excellent equestrian facilities include a block of 4 large well equipped stables and 3 timber stables with power and water, a turnout area and a main outdoor arena with a Cushion Track classic surface. Immediately draws visitors to the open plan living dining kitchen, which is on a split level. Bespoke handmade by ‘Simpsons’ of Colne comes complete with an installed ‘Aga’ as well as all the other high end appliances expected in a kitchen of this quality. The centre island and work units have granite worktops and the dining area is situated in front of a large barn arch window and door which open out onto a large patio area taking advantage of the stunning long distance views of the garden which can be taken in from the kitchen. Fully glazed and to one side has doors opening out onto a veranda. It is also has a log burner installed. Cloakroom and access to the utility room. Bespoke fitted utility with rear door for access. With oak units, providing ample space and has one of original open fireplaces. Further down the hall are part glazed double oak doors leading to the formal living room. Exposed beams and a stunning stone fireplace with a large log burner installed. To one side is the original porch to the farmhouse and to the other is the garden room. Overlooking the far reaching countryside surroundings. The entire ground floor of the property has a complementary blend of traditional character meets contemporary finish, with stone flagged floors with under floor heating, exposed beams and original fireplaces and oak joinery work. Original beams and trusses that have been meticulously restored. Beyond here there are four double bedrooms, all with en-suite. With a fully glazed wall and balcony with views capturing the open countryside. This room also has a walk-in wardrobe and dressing room, along with four piece en-suite bathroom. Walk-in wardrobe fitted out by ‘Simpsons’ of Colne, ensuite bathroom. White Stones Farm is approached via a long private tarmacadam driveway with electric gates opening up onto a large yard with ample parking. The farmhouse has well-presented gardens with lawned areas and mature flowerbed borders. There are numerous patio areas and the entire garden is surrounded with a traditional stonewall boundary. There is a double garage with electric up and over doors, power and water installed. There is an external stone staircase that leads to the first floor, where there is a large room currently being used as a gym, but could also provide further accommodation, or office area. There is a separate cloakroom installed. White Stones Farm has been developed to offer superb equestrian facilities. The main stable block has four large stables with rubber mat bases, automatic water drinkers and power installed. To one end there is a preparation room with wash down facilities and a horse solarium installed and a mezzanine storage area. Across from here is a fully fitted tack room with rug drying room attached. To the far end of the main stable block is a covered muck midden as well as access to a WC. On the back of the stables is a raised decking area which provides a great spot to view the horses, while they are being exercised. There are a further set of three timber stables also with rubber bases along with power installed and a water supply. Connected to the stables is a turnout arena that has been professionally installed and is 20m x 20m (65ft x 65ft) with a surface of rubber and silica sand with added fibre. The main arena has been professionally installed and is 65m x 25m (213ft x 82ft) with a top of the range Cushion Track classic surface installed, comprising of silica sand with synthetic fibre, a waxed coating and added fibre. This is a great addition to the equestrian yard. 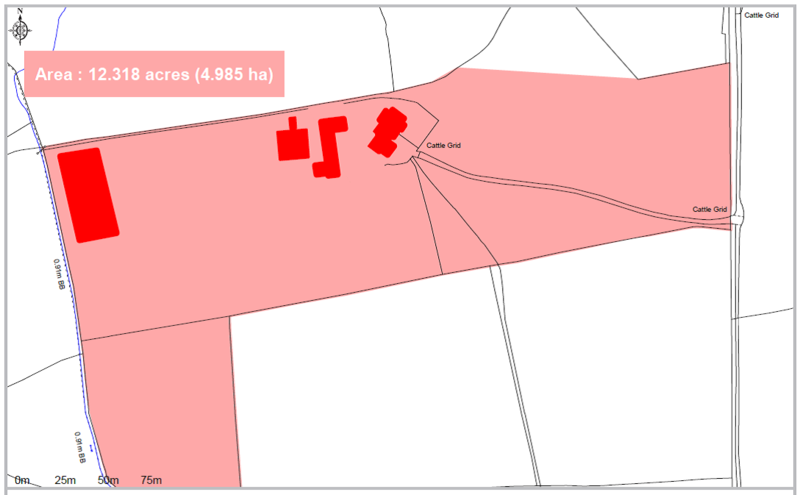 White Stones Farm benefits from 12.318 acres, including grazing land with stock proof boundaries and mains water to all horse paddocks. 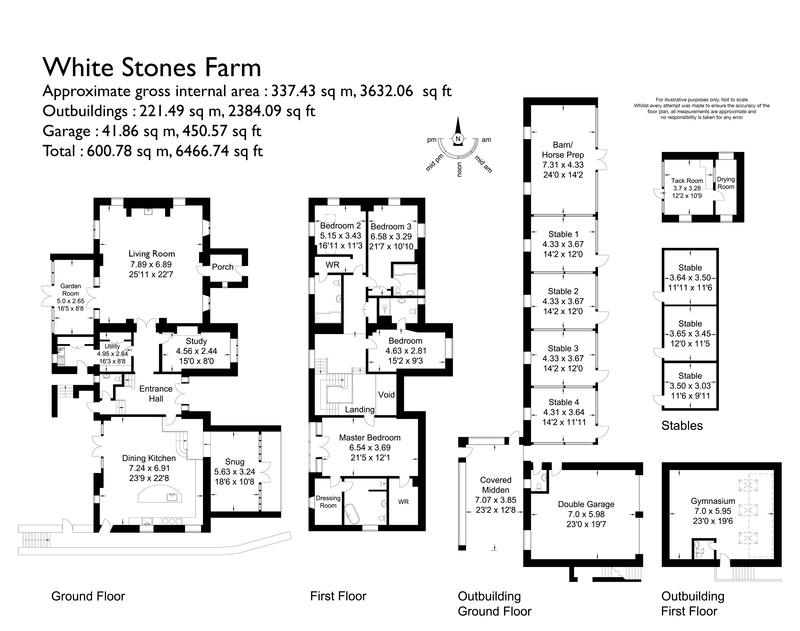 Please refer to the site plan for further details. Mains Water, LPG central heating, mains electric and private drainage. The property benefits from Wave Internet, with download speeds of up to 30Mb/second.